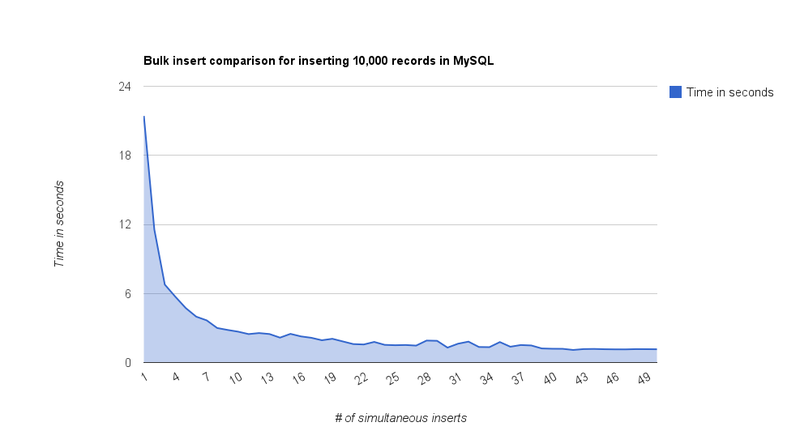 I had always wanted to test the performance of MySQL’s bulk inserts and finally got a chance to do so – I was pretty surprised at the results. I basically ran the same insertion – of 10,000 rows – on an Amazon EC2 instance by appending a few of them together to be bulk inserted and calculated the time it took for the complete 10,000 row insertion to complete. And this was what it looked like – at 50 combined inserts, the 10,000 rows were added in slightly over a second.